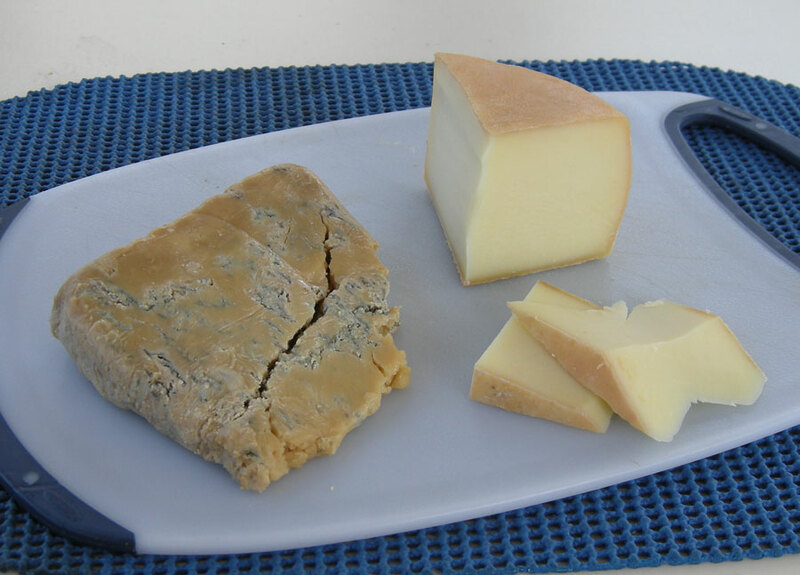 Our lunch after docking at the County Cheese Company in Waupoos: Marvelous Magie de Ganaraska (right) and Voyageur, a strong blue with a unique hint of sweetness. Click on any image for an enlarged view. If you sailed to Iles de la Madeleine in the Gulf of St. Lawrence, you could visit Fromagerie du Pied-de-Vent. On the west coast, you could call at Salt Spring Island in the Strait of Georgia and visit Salt Spring Island Cheese. But you’d have to hike or cab to get to the cheese. In Ontario, you can step off the boat and in less that one minute be inside the County Cheese Company to taste and purchase artisan cheese. Which is what we did this afternoon while on a boating holiday around Prince Edward County. One-month-old County Cheese Company is based in Waupoos Marina just down the road from County Cider Company and Waupoos Estate Winery. 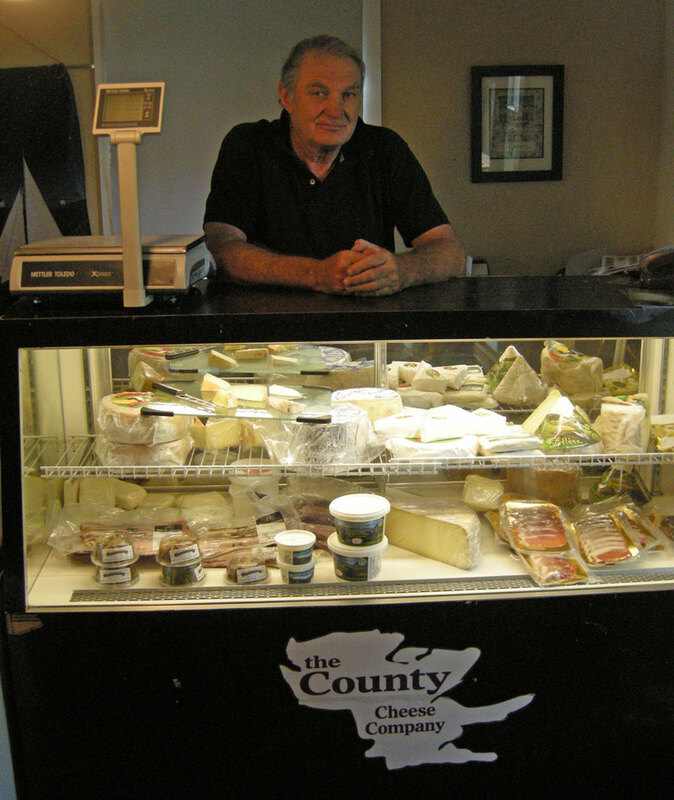 John Thomson of KendalVale Cheese and now also the County Cheese Company at Waupoos Marina in Prince Edward County. A Canadian filmmaker turned cheese entrepreneur, John Thomson, opened a retail store adjacent to the Blue Moose Café in the marina on the Civic Holiday weekend. By the spring of 2013, Thomson plans to be producing sheep’s milk cheese in the Old Waupoos Canning Factory building on the marina property. Thomson isn’t exactly a newcomer to cheese. He started KendalVale Cheese about a year ago. He transports Ontario sheep’s milk to Quebec where it’s turned into fine cheese at La Moutonnière, an established award-winning fromagerie operated by Lucille Giroux and Alastair Mackenzie in the village of Sainte-Hélène-de-Chester. The KendalVale cheeses—Magie de Ganaraska, Commanda, Voyageur and Champlain—have quickly become favorites with cheese lovers in Ontario and chefs such as Jamie Kennedy. Thomson has set up his own distribution system and also represents the award-winning cheeses of La Moutonnière such as Bleu de La Moutonnière, Fleurs des Monts and Sein d’Hélène. The County Cheese Company shares a building with Blue Moose Café steps from the docks at Waupoos Marina. County Cheese will operate the café during the fall, winter and spring. Following the closing of Fifth Town Artisan Cheese early this year. Thomson saw an opportunity to develop a cheese production facility in Prince Edward County, often called the hottest new culinary destination in Ontario. He did consider making a bid for Fifth Town assets but decided to pursue his own direction with the support of Prince Edward/Lennox & Addington Community Futures Development Corporation (PELA CFDC)* and others, including Linda Bell, owner of Waupoos Marina. By boat or other means, Waupoos is about to become a must-stop on any visit to Prince Edward County. Black River Cheese Company, which has been producing cheddar in the County since 1901, is a short distance from Waupoos. There is a small dock at the rear of the plant on Black River but we’re not certain it can be reached by anything but a small boat. We’ll have a report on that in a few days. —Georgs Kolesnikovs, aboard the power yacht At Last! * PELA CFDC is a community-based, not-for-profit corporation whose objective is to encourage local entrepreneurship and economic development. PELA CFDC specializes in providing business loans, grants, and training.